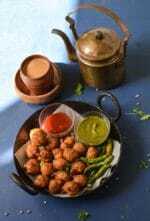 Gobhi Pakoda -Fried snacks and starters are a hot favorite during winters.As cauliflower is very easily available during this seasons so we make khasta gobhi,and many recipes and starters with cauliflower. 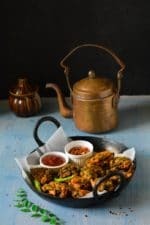 My favorite is Aloo gobhi ki subzi and Gobhi matar ka keema .There are so many fried snacks but I often make this easy,delicious and crispy cauliflower fritters which I make in few variations. 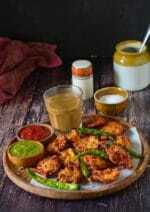 Today I am sharing my favorite version of making gobhi pakora ,to make this blanched cauliflower florets are dipped in gram flour,corn flour and semolina batter and then deep fried to a nice golden colour.These Gobhi pakoras are good to serve a crowd or on any special occasion,can be served with tomato ketchup or any tangy and spicy dip. 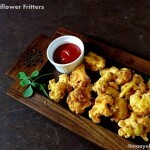 Make medium size florets from cauliflower. Boil 2 glasses of water add 1/2 tsp of salt and 1/4 tsp of turmeric powder. 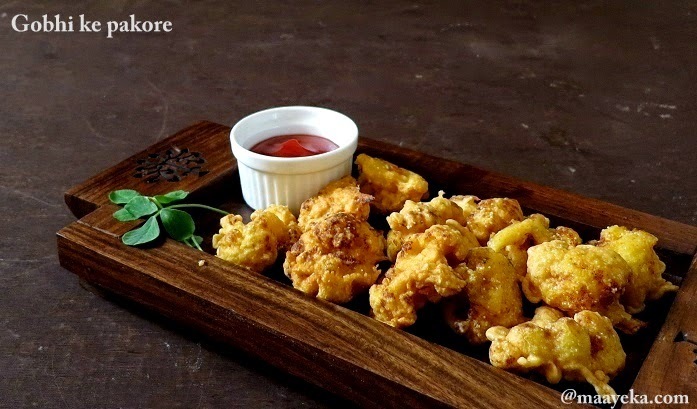 When it start boiling add cauliflower florets and cook for 1 minute. Drain and let it cool down completely. 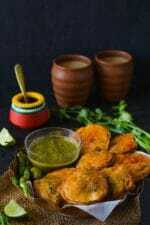 In a bowl add gram flour,corn flour,turmeric powder, semolina, salt, chili powder and cumin powder. Add water in the mixture and whisk well. 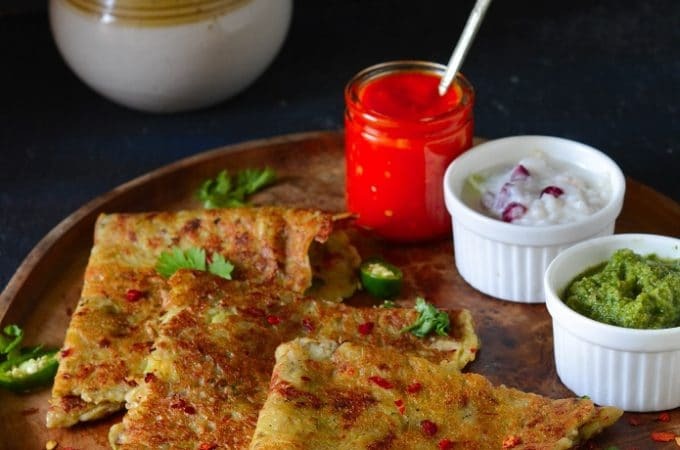 Make a medium thick batter and rest for 10 minutes. 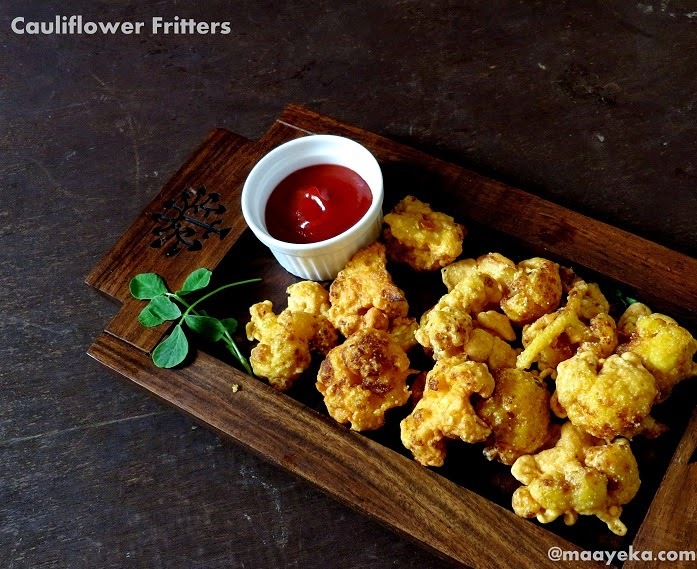 Dip the cauliflower florets in the batter and deep fry in hot oil on medium heat. 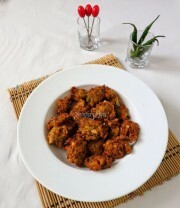 Drain on a paper napkin and serve hot. yum for the winter season. 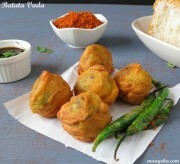 I love all your recipes and your kaddu ki subzi is such a hit with my family. Regards on Christmas Anjanaji.